The real time accounting (or on the fly) over Ethernet has been designed to emit tickets towards an external accounting application. These tickets can be masked on the level of the number emitted according to the type of communication (normal, business and personal). The type of tickets (public, private, outgoing, incoming and so on) can be filtered. The format of the tickets is identical to that of the tickets stored in compressed form (/usr4/account/*.DAT). IMPORTANT: The use of the real time accounting is exclusive: the selection of the tickets via Ethernet prohibits the use of the output of the tickets on V24 interface and vice-versa. Our software should work in the TCP client mode. It means that our software will initiate connection with the PBX and the PBX will work as a server. 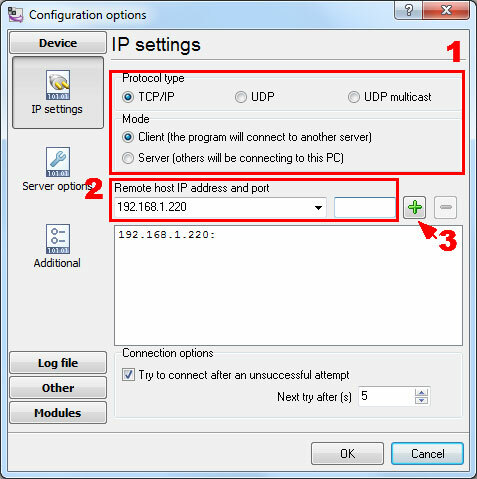 Add one or several PBX IP addresses here (the IP address of the Alcatel OmniPCX Enterprise). The port number should match the port that you have defined within the PBX (2533 in the example below).